Chicken salad kids cooking party. Try these chicken salad croissants for a fun chicken salad kids cooking party. You can use a hard roll, toasted French bread or pita bread in place of a croissant. For this kids cooking party, you will want to write down the chicken salad recipe below. Create one for each child that will be at the party. This will give them each a chance to follow the recipe while they are preparing the menu. It is also a good idea to include an extra one for them to take home, one that won't get messy. They can impress their own family with what they learned at the party. Once you know the number of children coming go through the list of things needed especially utensils, bowls, etc. If you need extra ask friends or family if you can borrow some items for a chicken salad kids cooking party. This recipe is enough for about 6 sandwiches double the recipe if needed. The children will be mixing their own ingredients in their own bowl so they will be able to add and choose as they will. It is a good idea to have extra on hand if needed for this chicken salad kids cooking party. Cook chicken ahead of time so it will be ready for the party. If you have an older group of kids who can cut or chop with sharp knives you can allow them to cut cooked chicken, celery and pickles with supervision. If they are too young or you would like to do this step yourself prepare this ahead of time. Give each child a bowl. Have each child add about ¼ -1/2 cup of chicken to their bowl, ¼ cup celery, a handful of almonds and a spoonful or however much they would like of pickles. Stir ingredients together. Let children peel eggs and chop them with a non sharp knife. Add to your chicken mixture. Have each child add a spoonful of mayonnaise and ¼ teaspoon lemon juice. Sprinkle with salt and cheese. Mix well to combine. 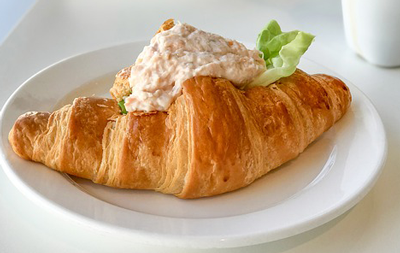 Spread chicken mixture on their croissant and they can enjoy or save until eating time. Here are more chicken salad recipes if you'd like to try another recipe. Back to Kids Party Page from Chicken salad kids cooking party.